The jam-packed event quickly filled with eager attendees impatiently waiting for seats and left many lining the walls of the theater for hours just for the sight of the legendary director. Dr. David James, Professor in the Bryan Singer Division of Cinema & Media Studies, presented the award and highlighted its significance by describing the awardees of the Eisenstein Award as the “most remarkable and visionary” cinematic leaders. 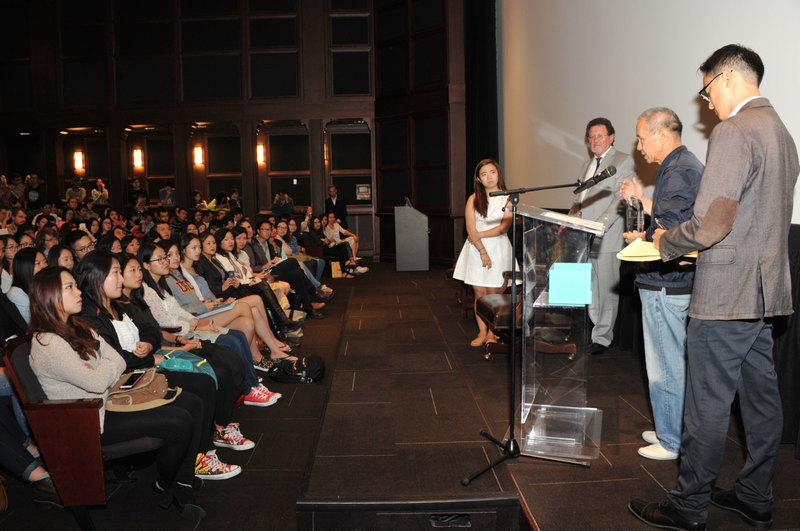 Additionally, in his opinion, Dr. James declared Hou Hsaio-hsien as the greatest filmmaker of our time. Upon receiving the Eisenstein Award, the Taiwanese filmmaker humbly exclaimed, “This is so heavy!” which sparked a roar of laughter in the audience. As an alumnus of the Taiwan National University of the Arts, Hou Hsiao-hsien progressed quickly from a student of film to an assistant director and soon thereafter began directing his own features. Dr. James explained the focus of Hou Hsiao-hsien’s film content as blending cultural heritage with global cinematic consciousness, while also highlighting the stories of everyday people amid historical changes. A Summer at Grandpa’s (1984); A Time to Live, A Time to Die (1985, FIPRESCI Award, Berlin International Film Festival), and Dust in the Wind (1986), were all highly personable films inspired by his own life. The Cannes Film Festival has screened nine of the director’s films. Furthermore, The Assassin will represent this year’s Taiwanese entry for the Foreign Language category at the Academy Awards. Hou Hsiao-hsien employs a powerful directing style involving a cineaste of fragments, memories, emotions, and sensations. His mode of film composition features deep focus as well as long takes, often amplifying the emotional intensity of the characters. Dr. Akira Lippit, Vice Dean of the School of Cinematic Arts, who moderated the Q&A aimed the dialogue primarily at the director’s introspection and thoughts concerning genres as well as Hou Hsiao-hsien’s particular style. Hou Hsaio-hsien testified, “Cinema is an evolving medium where visual language can continue, with so much room to grow.” The director aims at uncovering the hidden depth, atmosphere, and mystery underneath the surface of his images. Hou Hsiao-hsien compares this strategy to the underlying meanings he often finds in literature, which he considers a subject of the utmost value in shaping him as an artist. Ultimately, Hou Hsaio-hsien strongly stands behind his beliefs regarding the significance of a filmmaker. He views observation and attention to the way we grew up - life, family, friends, memories - as the mold of this artistic role. It is through this sharp awareness filled with high sensitivity and respect for reality, that Hou Hsaio-hsien achieved such an amazing distinction not only at USC, but internationally as well.